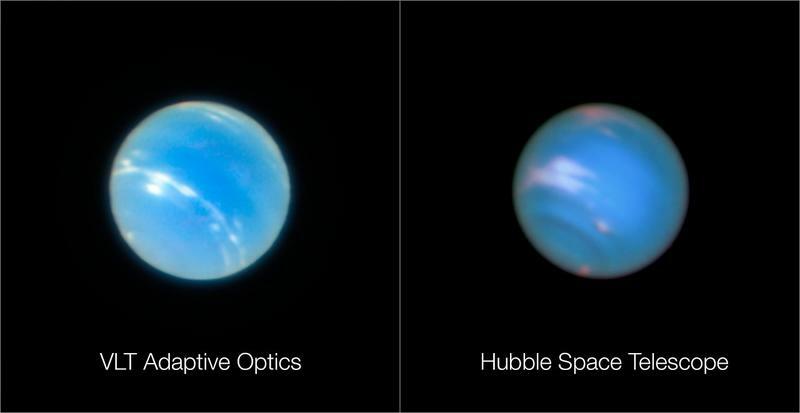 Scientists from the European Southern Observatory (ESO) have shared new images of the planet Neptune, and they’re some of the best we’ve ever seen of the distant planet. In fact, they rival images previously snapped by Voyager 2, which flew by Neptune back in 1989. The images were captured by the ESO’s Very Large Telescope (VLT) using a new adaptive optics mode known as laser tomography. By utilizing the new technique, scientists are able to capture images from Earth that are sharper than those snapped by the NASA Hubble Space Telescope, which is currently our planet. Scientists say the unprecedented technology will allow them to better study properties of cosmic objects. The MUSE (Multi Unit Spectroscopic Explorer) instrument on ESO’s Very Large Telescope (VLT) works with an adaptive optics unit called GALACSI. This makes use of the Laser Guide Star Facility, 4LGSF, a subsystem of the Adaptive Optics Facility (AOF). The AOF provides adaptive optics for instruments on the VLTs Unit Telescope 4 (UT4). MUSE was the first instrument to benefit from this new facility and it now has two adaptive optics modes — the Wide Field Mode and the Narrow Field Mode. The MUSE Wide Field Mode coupled to GALACSI in ground-layer mode corrects for the effects of atmospheric turbulence up to one kilometre above the telescope over a comparatively wide field of view. But the new Narrow Field Mode using laser tomography corrects for almost all of the atmospheric turbulence above the telescope to create much sharper images, but over a smaller region of the sky. Earth-based telescopes often struggle to capture sharp images of distant objects due to the Earth’s atmosphere, which tends to distort light as it passes through. That’s why when you look up and see a star you’ll see it twinkle. 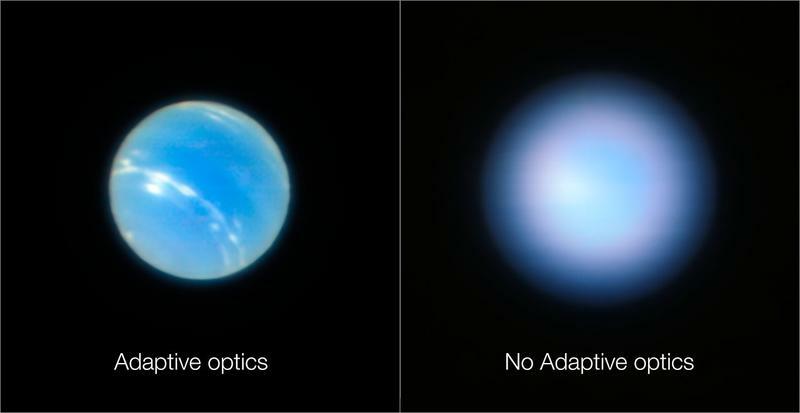 The adaptive optics of the VLT compensates for the blurring effect, according to the ESO, allowing for sharper images to be captured. With the technology, scientists are hoping to study objects such as supermassive black holes, jets from young stars, globular clusters, supernovae, and more. 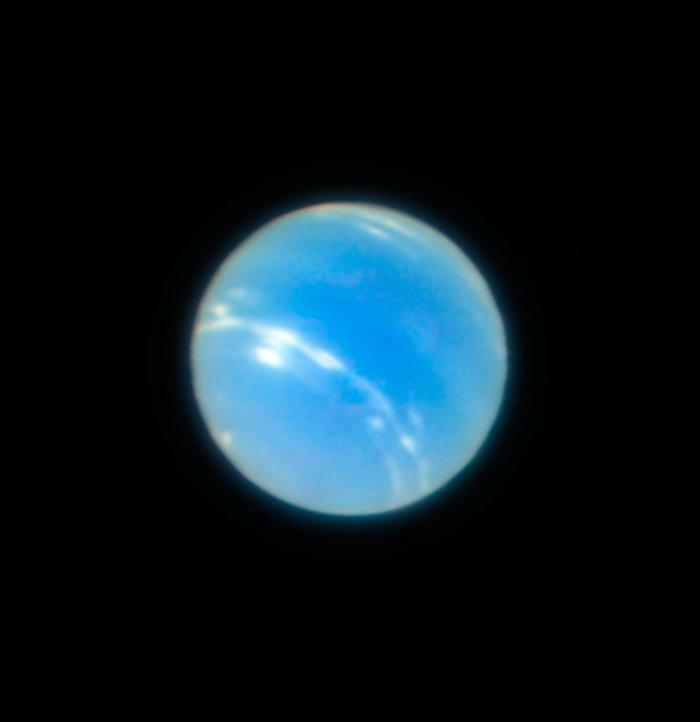 For now, we have these spectacular images of Neptune to drool over.